Our client James runs a small property development business in Bristol and is now a regular customer, returning for various glass and handrail systems over the last few years. This latest project required external glass balustrading to two balcony areas and a set of steps as well as a Juliet balcony guarding to match. 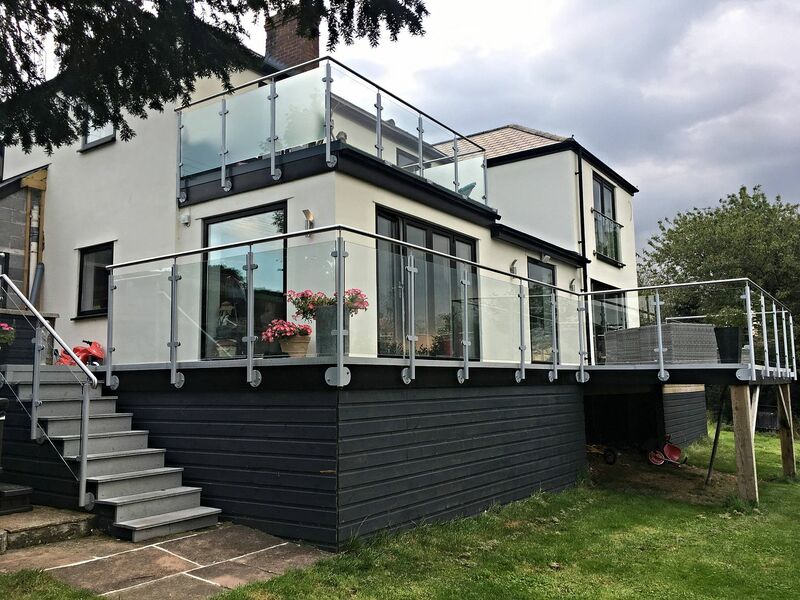 The materials James frequently opts for is a combination of our system 1 and system 10 glass balustrade designs; using galvanized and powdercoated base plates and posts, toughened glass infill panels and a stainless steel top handrail to create a modern but subtle finish. The top balcony area also features frosted glass side screens to provide enhanced privacy. The base plate detail used is side-mounted to the fascia where possible to maximise the useable external area for James’ client whereas the higher balcony has a bespoke fixing detail to the front elevation to suit the existing decking construction. Like many of our customers, James sends through some basic dimensions and we design, manufacture and deliver for DIY assembly. Visit our online glass balustrade shop for designs and prices.